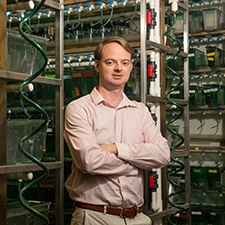 The Megason Lab uses imaging-based systems biology to elucidate the systems level principles of animal development. We are particularly interested in long standing problems in embryology whose understanding has defied molecular reduction namely patterning, morphogenesis, and size control with a focus on the nervous system. We pursue these questions in the inner ear and spinal cord of zebrafish using a variety of techniques including genetics, microscopy, and modeling. Biological form is generated during development as the seemingly simple egg elaborates into the morphologically complex embryo. I believe that the mechanistic principles that turn an egg into an embryo span many levels from molecules to cells to whole tissues. Developmental biologists have been quite successful in recent decades in determining molecular level mechanisms, such as the genes governing cell fate decisions, but have made comparatively little progress in other long standing questions in development such as patterning, morphogenesis, and size control. There are two reasons for this failure. One is that these questions cannot be answered using the reductionist logic of one gene, one function. Understanding these phenomena will require a more systems biological approach. The other reason progress has been slow is because the key mechanisms regulating these phenomena do not only occur at the molecular level but also occur at higher levels such as cell dynamics and tissue mechanics. We have developed a technological approach called in toto imaging which is capable of capturing biological information across all these scales—molecular, cellular, tissue, and whole embryo—in a dynamic fashion. For in toto imaging, we use transgenic zebrafish embryos that are labeled with multiple colors of fluorescent proteins; high-resolution, timelapse confocal/2-photon microscopy is performed to generate image sets containing 100,000 images; and custom developed software called GoFigure is used to track all the cells and quantify molecular, cellular, and tissue level data. We are using in toto imaging in combination with mathematical and computational modeling to elucidate the multiscale principles controlling patterning, morphogenesis, and size control in the zebrafish inner ear and spinal cord.